The battle of special editions is over. Saints Row IV may have just won - beating all past and future special editions available. The $99 Special Edition for the game is dubbed the "Super Dangerous Wub Wub Edition" - and for good reason. 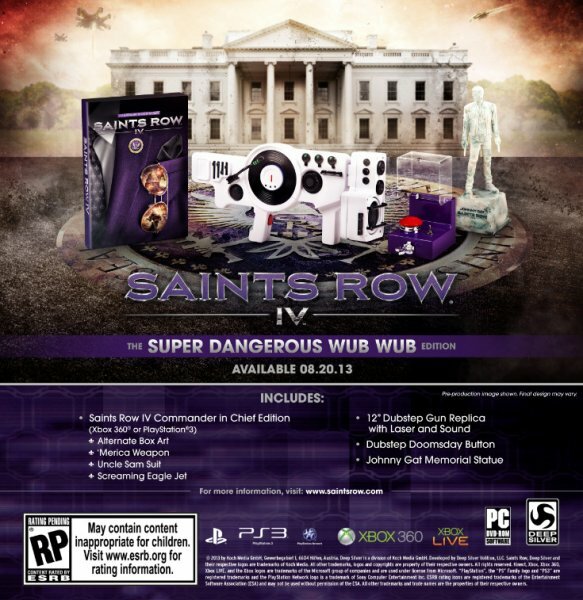 Included in the box you've got your Saints Row IV Commander and Chief Edition which comes with all the goodies - but its the physical goods that set this SE apart. A 12" replica of the game's infamous Dub Step Gun is included, complete with laser sights and replica sounds ensures you can throw a dancing monkey wrench into your next neighborhood Nerf gun battle. Also included is a Johnny Gat memorial statue as well as a "Doomsday Button." Ya know, for when stuff goes down you can basically get the last laugh - with dub step. Not a bad deal for $99. It goes on Sale August 20th in limited quantities. Order two and have a dub step battle in your living room. The world will never be the same. Saints Row IV features two player online co-op on the Xbox 360, PlayStation 3 and PC.